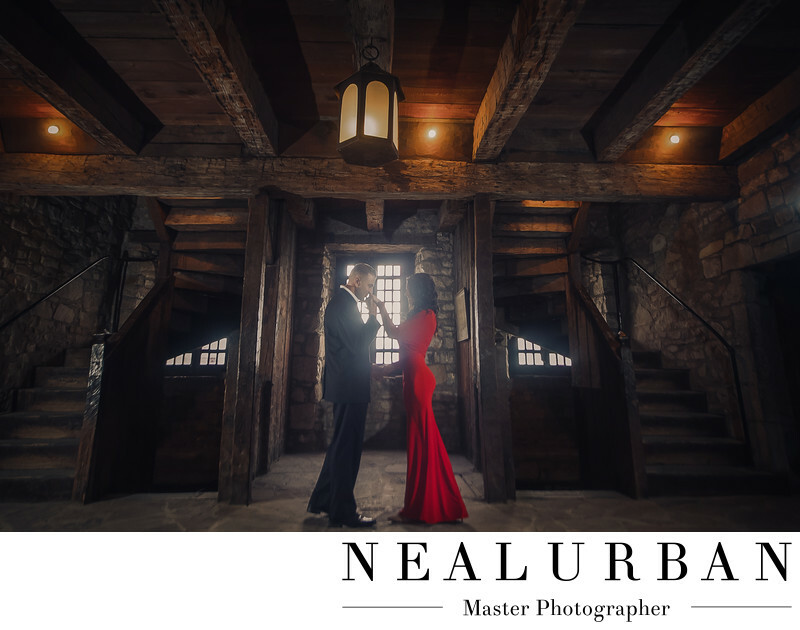 We loved this engagement session at the Old Fort in Youngstown, NY with Nina and Vinny. Nina was a huge Disney fan. Her favorite movie was Beauty and the Beast. We wanted to create something magical for her that could represent that princess style feel. This was one of the buildings at the Fort, and also our favorite to shoot at. Nina and Vinny had the perfect outfits too! They went super dressy. Nina went with a very bold red dress. They both looked amazing! We loved how the outfits looked with the rustic feel of this building. It was pretty dark here as well. There was just enough back light coming from the window behind the couple. We did have to brighten up their faces with an additional light. But, we loved the few lights and lanterns that were on the ceiling. They helped to create a nice glow in the image. We love how there were matching winding staircases on both sides. They framed in Nina and Vinny so nicely. We had Nina walk up to Vinny and hold out her hand. He gently took it and kissed it. It felt like we were in a fairy tale. It was exactly what we were going for! They went on to have a beautiful wedding at Antonio's Banquet and Conference Center in Niagara Falls. They had a May wedding! Location: 1 Scott Ave. Youngstown, NY 14174 United States.